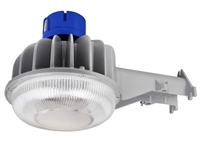 Whether you’re installing LED garage ceiling lights on a motor or mounting them above a security door, commercial LED lighting fixtures like these are a great way to protect against birds and surges. Each model comes with an acrylic lens, bird guards and surge protector. They’re also a great option for roadway lighting on smaller city roads and can be purchased in 31, 63, 94 and 125W settings. Shop today and save with free shipping on your order of LED utility lights at Cors Lighting!